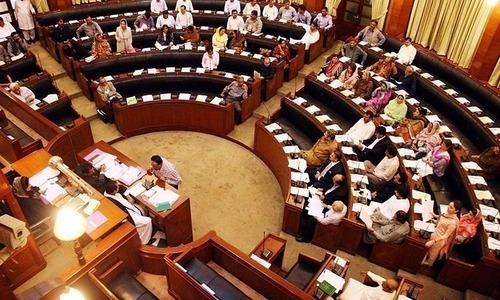 KARACHI: The Sindh Assembly on Wednesday approved the establishment of an accountability body that would replace the decades-old Anti-Corruption Esta­blishment. Before the Pakistan Peoples Party lawmakers voted in favour of the Sindh Accountability Agency Bill 2017, the joint opposition in the house — the Muttahida Qaumi Movement, Pakistan Muslim League-Functional and PML-N — launched a noisy protest and shouted slogans declaring it a “black law”. Senior Minister for Parliamentary Affairs Nisar Ahmad Khuhro took up the bill for clause-by-clause consideration, but the opposition’s protest continued and PML-N lawmaker Ameer Haider Shah Sheerazi tore a copy of the bill and threw it on the floor. Finally, the opposition lawmakers staged a walkout and the bill was passed with a voice vote in their absence. Members of the Pakistan Tehreek-i-Insaf were not present in Wednesday’s session. With the enactment of the bill, the Sindh Enquiries and Anti-Corruption Act, 1991 and Rules made there under stand repealed and all cases pending with the Anti-Corruption Establishment, its employees, assets and liabilities are also transferred to the new agency. Under the new law, the Sindh government would establish accountability courts in the province and such courts would be headed by a district and sessions judge (DJ), or a person qualified to be appointed as DJ. There would also be an accountability commission comprising chairman of the agency, advocate general of the province, prosecutor general, director general and director investigation of the agency. The commission would review the progress of cases of corruption and recommend to the government steps for the eradication of corruption in Sindh. 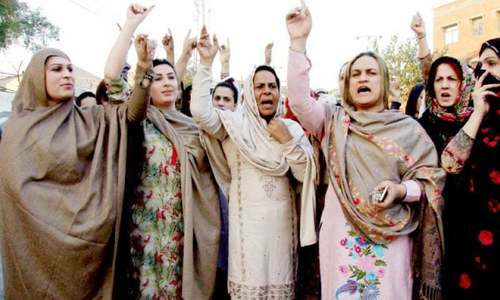 Deputy Speaker Syeda Shehla Raza, who was presiding over the session, ruled that the bill was unanimously adopted, as only members of the ruling party were present in the house. amendments in the report and the same had been accommodated by the standing committee. He said that this bill would be more effective to check corruption rather than the National Accountability Ordinance (NAO), which was imposed by a dictator. Sardar Ahmad of the MQM said that Article 143 of the Constitution did not allow a province to legislate a law which confronted federal laws. Referring to the repealing of the NAO’s applicability in the province, he said that the law still exists in three other provinces and neither the Supreme Court nor any high court had declared it illegal. He also pointed out that under the relevant UN convention the federal government was bound to frame a law by parliament to eliminate corruption. “We have our reservations on the bill ... you have majority in the house and can carry out any legislation. We have recorded our objection as the new law would be controversial,” he added. She said her party, like the entire opposition, had reservations at the time of the introduction of this bill and it would never support it; the opposition would challenge it in court. He said that Sindh police chief had also expressed no confidence in the government. Mr Sabzwari further said it appeared that the bill was not aimed at elimination of corruption but covering up corruption and for political victimisation of opponents. “We would take the issue to the people and the court of law,” he declared. 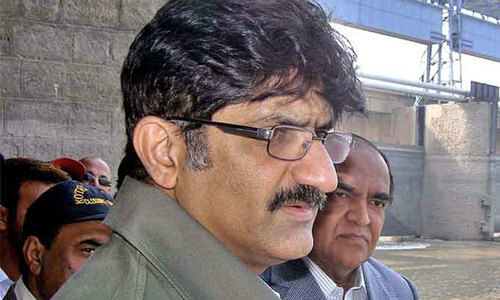 Responding to the objections raised by the opposition on the bill, Chief Minister Syed Murad Ali Shah said that except Sardar Ahmad no other person from the opposition had discussed the bill. He said the “proposed measures to curb corruption fall under Article 142-(B) as such it cannot be objected [to]”. He questioned as to how the Khyber Pakhtunkhwa government made their accountability law if the subject of anti-corruption fell under Article 143 of the Constitution. He said it was surprising that the members of the house were saying that they were not capable of legislation and objecting to the repeal of the NAB ordinance. He said that the apex court itself had declared the NAB Ordinance to be without legality. He offered to withdraw the bill if the opposition showed him that the subject of corruption was on the Federal Legislative List. Mr Shah said that he had no role in the selection of the chairman of the agency, who would be a retired high court judge and the nominee of a six-lawmaker committee — three each from both treasury and the opposition — to be headed by the speaker, being a neutral person. He regretted that his party was being blamed for having no faith in the federation. The CM said everyone was at liberty to oppose the law and challenge it in court, but at least they should not doubt the intentions of the members of their own house. Later, PML-F’s Nand Kumar Goklani told the media that the joint opposition believed that the bill was framed to protect the bigwigs of the ruling party who were facing cases for corruption.